So in part 1 of learning how to price soy candles I covered how to find your base cost for each candle and the option to find out approx. how long it takes you to make the candles so you can figure out how much you want to earn per hour. Once you figure out approx. how long it takes you to make one candle (or a batch of candles, depending on how you want to do it), then take your chosen hourly rate…let’s say $8 per hour. So if it takes 20 min. to make 1 8oz candle (counting in the heating and cooling time before pouring) then divide $8 by 3 and it would be $2.66 per candle. Now of course if you can do batches of say, 6 candles in 30 min. then that would only be $.63 per candle, so much better to do batches if you can. Ok so now to find out what to charge for retail sales of your soy candles. The general rule is “Your cost” x 3 or 4= retail price. Plus if you want to factor in your hourly rate, just use the formula above and add it to the retail price per candle. So there’s a nice formula for you to use, but you will need to figure out your own base cost since costs for candle supplies will vary depending on where you purchase your supplies. Shipping supplies (you might want to somehow figure this into your retail price of your candles too. So if you will be specially packaging any of your candles, make sure to break down the packaging costs too. Usually it is best just to use flat rate priority mail boxes from USPS if you can, and you’ll probably get a good amount of packing peanuts and other packing stuff with your candle supply orders so then you can just reuse them when you ship out candles! I almost never had to buy packing material for shipping because of this! Higher electricity costs because of using the stove more. Cost of gas if you are driving to shows or events. Shipping costs when buying soy candle making supplies. Well, I think that’s about it! You’re on your way now to getting your soy candle business up and running! It is exciting, but remember, it is also a lot of hard work. Please feel free to post your questions in the comments section and I’ll do my best to answer them! Or you can contact me by email. So what’s next? Click below…. I have a question for you! We have our candles in a boutique and online right now so we have set prices. The prices include everything plus renting our space in the boutique. But when it comes to the shows, bazaars, fairs we do, should we lower prices and have set prices for those as well or keep the prices we have for the boutique/website? Thanks so much just wanted someone else’s opinion! I would keep your prices consistent. You can always do some sort of special at the bazaars and shows. Typically something like buy 1 get 1 half off, or buy 2 get one half off, buy 3 get 1 free….. etc…. I think it’s best to be consistent with the regular prices though. Thank you so much for this! I want to make/sell candles in my spare time and didn’t know what a good price for them would be. I can get a kit at work for a nice 30% discount, so it ends up being $3 a piece per candle my cost. This is a good guide and now I know $10 per candle is a good price! Wow, will people really pay that much for a candle??? My daughter and I are just starting out and I am freaking that it looks like it will cost about $8 per candle to make an 8 oz soy candle with color and fragrance in a tin. Is that really an okay price? I mean, great if it is, I just want to be able to sell the stuff! And that’s just supplies, not figuring in our time or anything. I’m a little confused about the pricing. I’m just starting and I see candle kits from$29-$200. For instance if I buy a candle kit for $29.00 I get 4-6 jars for the candles. If I sell them at price of $5.00 I’m making $0. How do I find cheaper candle kits so I can at least double the money? That is a good question. When you are first starting out, using a kit is a good idea so you can try it out first before really jumping in to candle making. It’s also good for trying out a different company for buying your supplies. 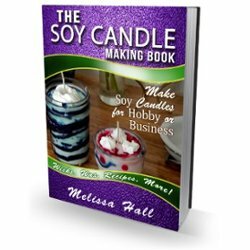 Once you get the hang of soy candle making and you want to get more serious about it and start selling them, you are going to need to buy in bulk in order to get your cost of supplies down enough to make money. Using the kits is not going to be cost effective for selling your candles. Generally candle makers buy the wax by the case, normally 50lbs at a time. Fragrance oil is another big cost of candle making and so you will want to buy those by the pound once you get going and know which oils you’ll be able to sell fairly well. They do have smaller sizes of oils you can buy as well if you aren’t quite sure if you’ll go through a whole pound yet or if you are trying out a new fragrance. Same goes for containers,wicks and dye, you’ll want to buy those in bulk as well.